The Weekly Notes series begins today and will run every Monday and Thursday throughout the season. Check back here to get caught up on all the recent news, notes, scouting reports, and other information from the Red Sox minor league system. The latest feature, added this year, is the Scouting Log. This makes it easy to see when there are new scouting notes added by the SoxProspects.com scouts. Look for many new scouting reports to be uploaded soon, as well as another scouting piece on the News Page from spring training. Over in the Meta Forum on SoxProspects.com, you can also vote on the Pre-Season All-Star awards for each position. The polls close at 5:00 pm today, so cast your votes before it is too late. The Transactions page had to be updated earlier this week when shortstop Jeremy Rivera was suspended 50 games for an unspecified violation of the drug program. The 22-year-old was ranked 33rd on the SoxProspects.com rankings coming off a year where he hit .260/.300/.334 over 365 at-bats for Salem. He was expected to open the season with Salem. In another move, the Red Sox have announced they will recall infielder Marco Hernandez from Triple-A on Friday, with Xander Bogaerts heading to the bereavement list, as Evan Drellich of the Boston Herald reported. The move comes with several Red Sox players coming down with flu-like symptoms. One move that was made before the rain-out was official was reliever Matt Barnes being added to the bereavement list after the passing of his grandmother. 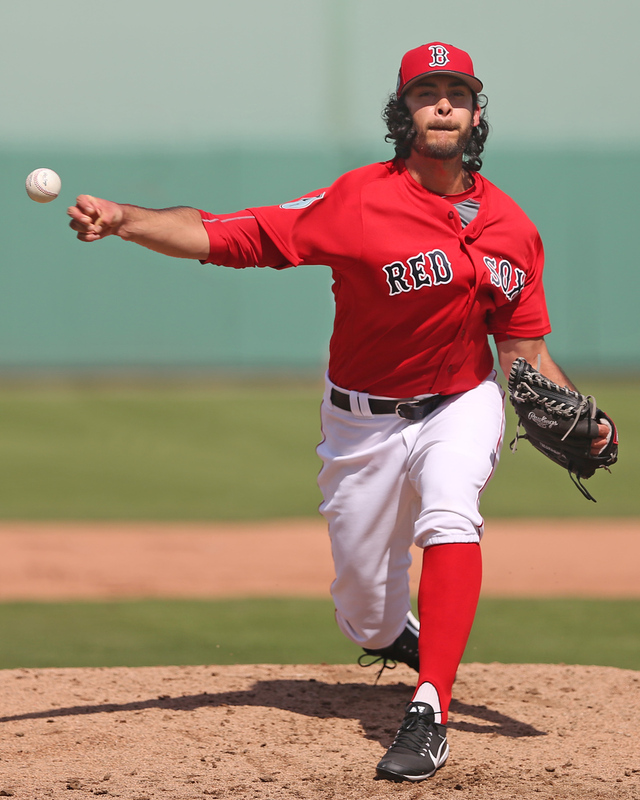 In his place, the Red Sox have recalled righty Noe Ramirez (pictured, above). By being placed on the bereavement list, Barnes is set to miss at least the next three games. Drellich also spoke to Red Sox President Sam Kennedy about locking up the organization's young stars, including top prospect Andrew Benintendi. Kennedy said there have been discussions already but would not go into more detail, ultimately saying that President of Baseball Operations Dave Dombrowski will make those decisions "with respect to the players' abilities." In short time, Benintendi has made a strong impression on press, coaches, and teammates alike. Scott Lauber for ESPN says that it's time for Benintendi to make his mark. Benintendi didn't wait long, launching a three-run home run on opening day. The post from MLB.com's Ian Browne has video of the bomb and quotes from Benintendi and manager John Farrell. 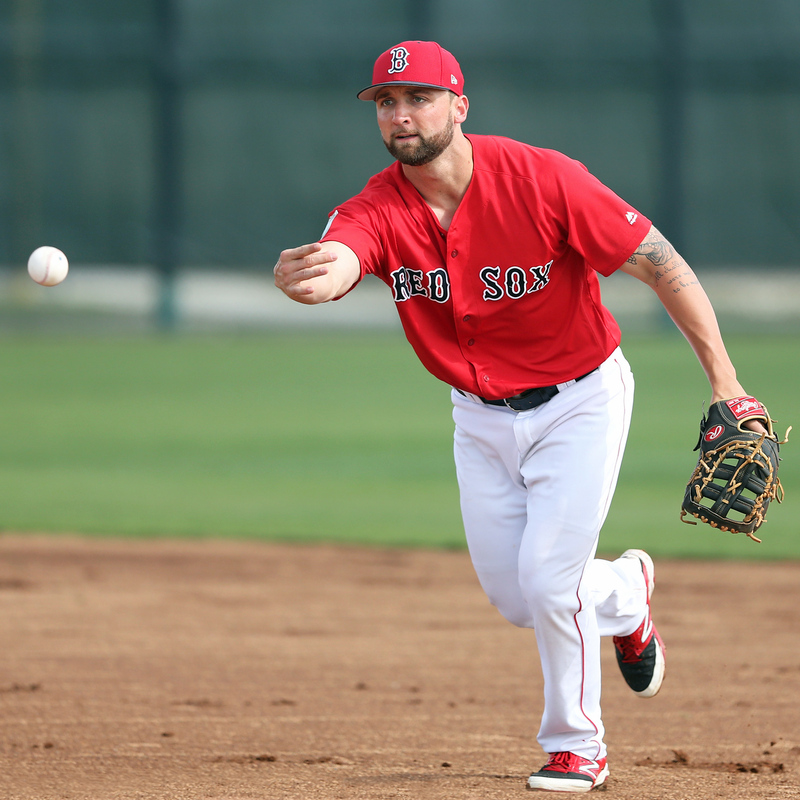 First baseman Sam Travis missed almost all of the 2016 season after tearing his ACL. Bill Koch writes for the Providence Journal that Travis aims to make it all the way back to his pre-injury form. Just in time for the minor league season, Eric Longenhagen released his top 15 Red Sox prospects list for FanGraphs. He includes scouting information and industry sources, KATOH projection system (which uses minor league data to project the future WAR of prospects), and "Mahalanobis Comps." Projections and comps are far from perfect, but it is interesting to see that the top comp for Benintendi is former Red Sox Johnny Damon, and the top comp for third baseman Rafael Devers is Eric Chavez. The 2017 MLB Draft bonus pools are out and Baseball America was the first to post the information. The Red Sox pick 24th in 2017 and that pick's pool amount is $2,614,500, up $423,300 from last year. Kate Bramson of the Providence Journal notes that the Pawtucket Red Sox have been considering two different sites for a new stadium complex in Pawtucket - the Apex department store and the Tidewater site along Taft Street. While they have not yet chosen which site to pursue, Bramson says that they plan to have the stadium be a "100 percent replica" of Fenway Park, with its most prominent features including the Green Monster and center field triangle. The Red Sox also have some construction plans in mind. Drellich writes that they have begun a "multi-phase project" to update their Dominican Republic complex. Kennedy says that their 16-year-old facility has fallen behind some other organizations that have new, modern complexes including their own in Fort Myers. Kennedy says the biggest improvements will be to the dorm facilities, weight room, and other amenities. Photo Credit: Noe Ramirez and Sam Travis by Kelly O'Connor.